Prescott to Kissimmee and back in August 2006 - 3,500 miles in 40 Hours. This map is clickable. Click anywhere on the route to view the area of interest. This account is divided into trip stages. Click on the stage below to view each stage. 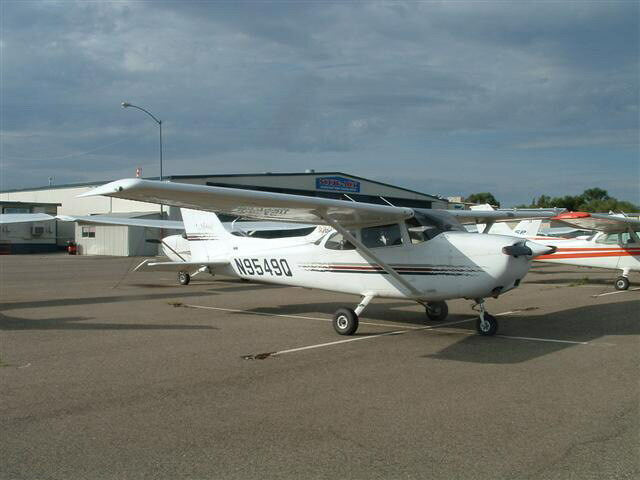 ....is Cessna 172-R N9549Q, a 160HP injected model that I have flown on numerous adventures in the western US. The 'R' model is a useful compromise for solo touring with plenty of performance even at the high altitudes and temperatures of Arizona, provided it is kept light. 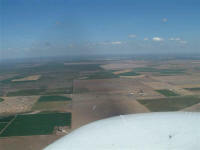 Instructors at Prescott seem to prefer the rather thirstier 'SP' models operating 2-up out of Prescott's 7,000' runway. For me, performance is not (well, hardly ever) an issue and the 'R' is available for long bookings, eliminating the stress of having to make 3Hrs every day that comes with rentals from some FBO's. I've written a few notes about the 172R and 172's in general that may interest other pilots. 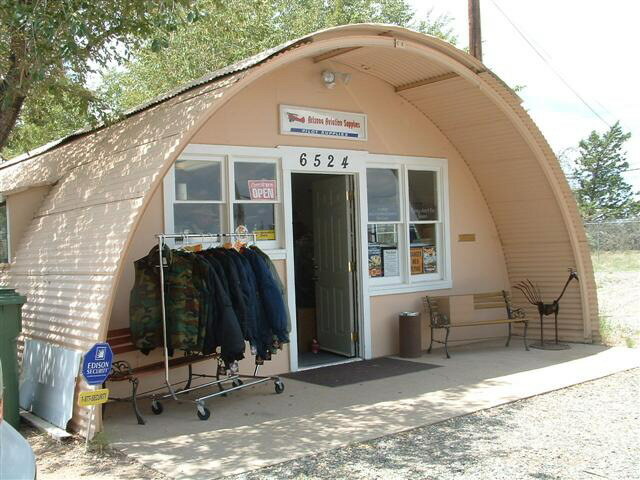 A 'must do' stop in Prescott in Randy's pilot shop or Arizona Aviation Supplies. Chatting with Randy on the morning of my departure, we suddenly noticed a movement in the corner of the open door, silhouetted by the blazing August sunshine outside. Randy reacted instinctively, clapping his hands and shouting loudly. The tiny head that had been peering in at us disappeared. Very cautiously, we approached the doorway. Outside on the veranda looking very relaxed was a large snake, looking very relaxed coiled and happily basking. 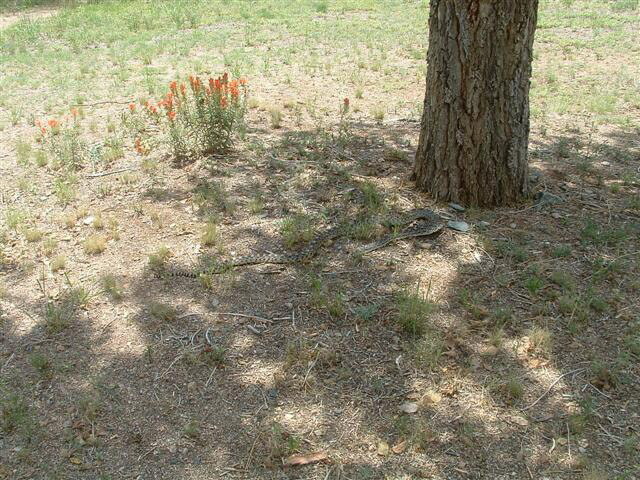 "It's OK, it's only a gopher snake" Randy said reassuringly. "They live on the golf course, where they eat ... gophers". Randy called the local snake man, but before he arrived our visitor decided to get in some more golf and departed in the right direction under an adjoining fence. This was quite the largest snake I've seen in the wild and handsome animal it was indeed. Apparently this was not the first reptilian visitor Randy has had - on another occasion a rattler came right inside seeking shade and took a bit of getting rid of. 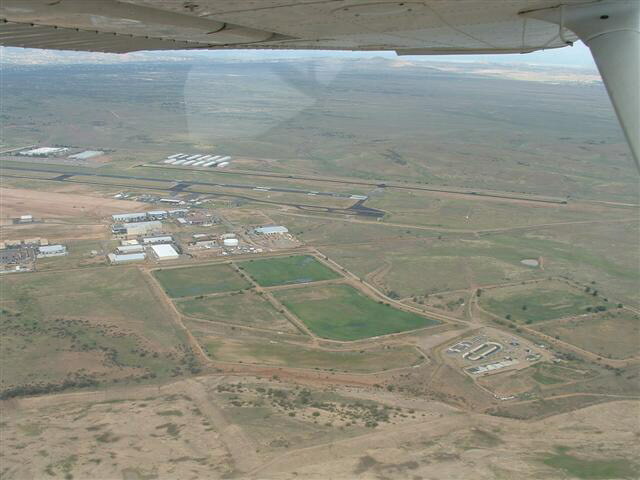 The two runways at Prescott's Ernest A Love field, said to be the 7th busiest in the US by number of movements. 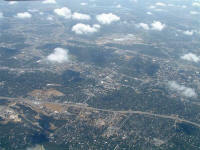 Prescott is about 50mi W of the Mogollon Rim, the edge of the high plateau that divides Northern Arizona. 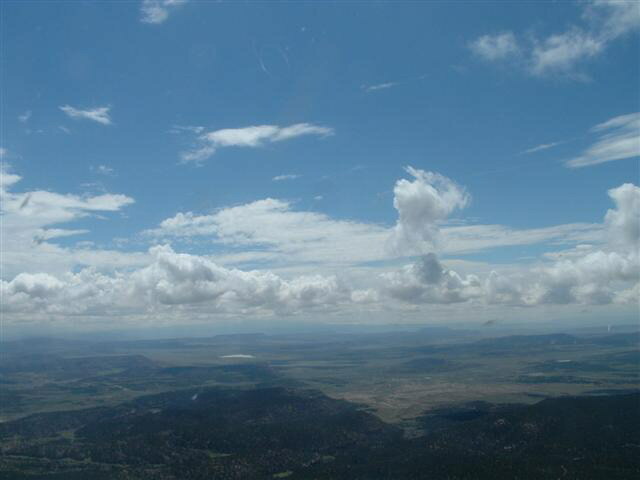 The rim often attracts a line of cloud and today is no exception. The Runway at Sedona, Az., sits on a high mesa and is known as "The Aircraft Carrier". Sedona nestles underneath the Rim at Oak Creek Canyon and is a tourist mecca. Today I'm happy to be proceeding overhead rather than crawling up the spectacular but traffic infested canyon road. Across the rim now and in the distance is a strange depression in the ground. 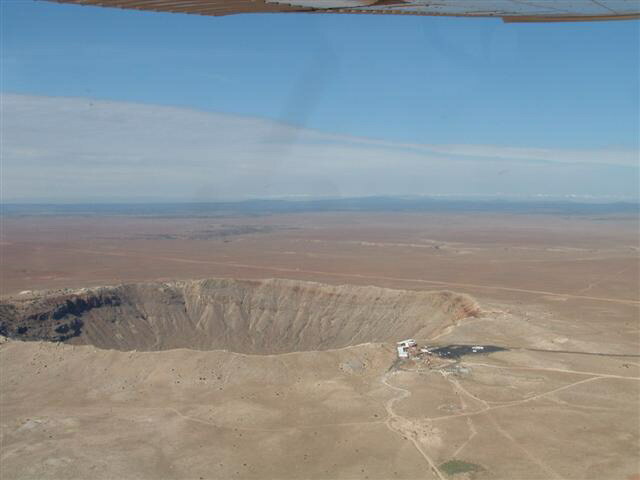 This the famous meteor crater, formed 50,000 years ago when a block of metal smashed into the ground. A large fragment is displayed in the visitor centre and the crater and it's strange indeed to touch the thing and realise that it as actually made of solid nickel, not the crumbling stony material of most meteorites. Onward, now, past Gallup, NM and out of my local area. Ahead the mesas of New Mexico dominate the skyline, like the view in monument valley away to the north. The terrain between Gallup and Albuquerque is truly remote with hardly a road or ranch to be seen. Away to the South, behind the line of mountains, is the Very Large Array of radio telescopes. Occasionally I can make out the sun glinting on one of the large dishes. Curiously there's no prohibition on aircraft flying right over the array, although it is in a Military Operations Area (MOA), best avoided on weekdays at least. Near Socorro, NM, the weather starts to close in and it's a relief to see the runways at Santa Fe ahead. While I've visited many airports in New Mexico this is my first time at Santa Fe and I'm not quite sure what to expect. In event, it's a lot quieter than the busy international airport that I'd imagined - perhaps the name 'Santa Fe' conjures up an image of past glories. I have a pleasant time strolling around the town and find it to be one of those arty places for grown-up hippies that you find in the west. If Western art and trinkets are your thing, then this is the place to be! 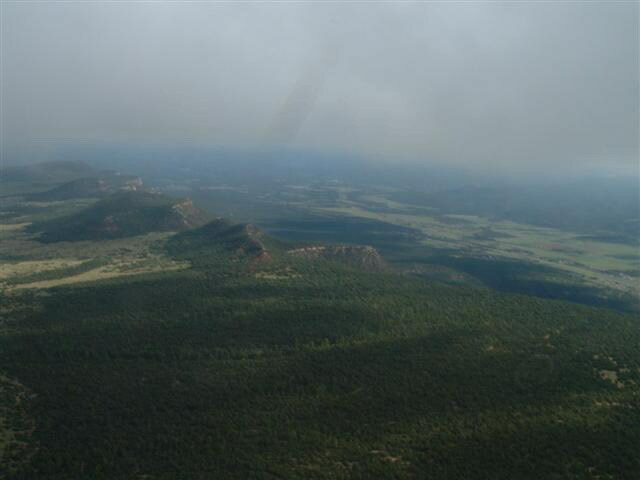 Nest morning the low cloud is still around, but the outlook to the East is good and soon we are in the Pecos River valley, tracking around the southern tip of the Rockies. To the North along the freeway is tiny Las Vegas, New Mexico, a place definitely not to be confused with it's Nevada namesake! I stopped here once out of curiosity and was royally received by the airport manager who said "they don't get many visitors here". The town is an interesting place in it's own right, steeped in Western history, and at the time at least consumed with the idea that the Mexicans were re-invading New Mexico by stealth! Somewhere here we have crossed the continental divide and now, technically, are in the East. 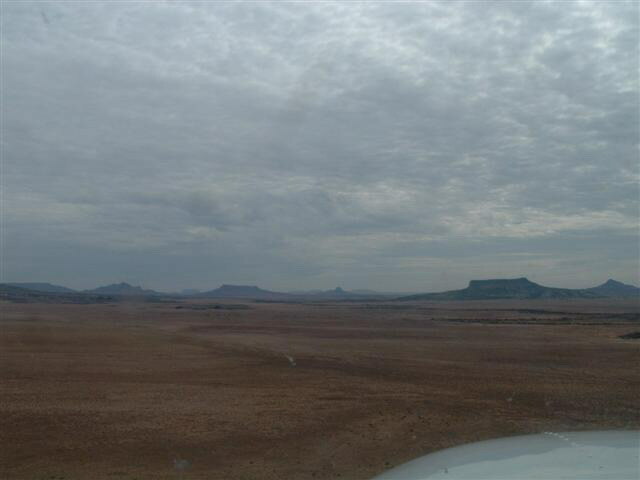 The weather brightens and the plains near Tucamcari, NM, beckon us on. Away to the south is the Texas panhandle, a huge area of farmland that takes a day to drive across in stupendous monotony. It was in the panhandle, in the cow-town of Amarillo, that I first came across that most awful of British imports in America, the roundabout. The way they had set it out, there was no indication of which way round to go! But not only was I confused: so were the locals, taking whatever course seemed best! 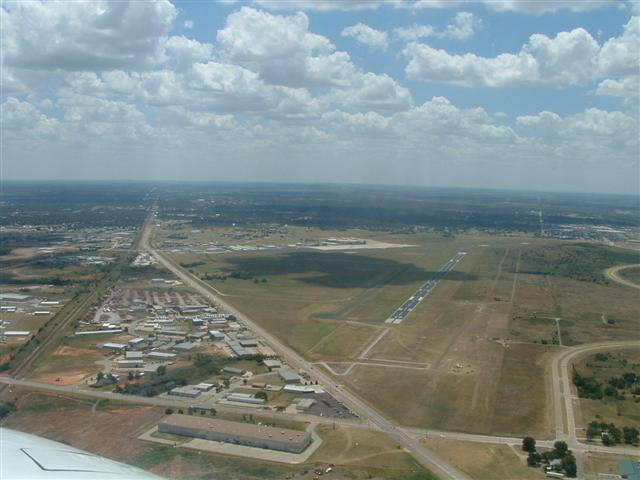 Now we are in Oklahoma and our destination of the university town of Norman, just south of Oklahoma City, comes into view. This has been the longest leg on the entire trip, 422 miles in about 4 1/2 hours, and it's good to be on the ground again. Throughout the whole trip I stuck to the mantra of "fly early" to avoid afternoon heating and thunderstorms and today I have arrived in Norman not much after midday. I have come to Norman to visit the Natural History museum and I'm not disappointed. This the home of the famous Tyrannosaur 'Sue' although disappointingly, I learned that the display is actually a cast. 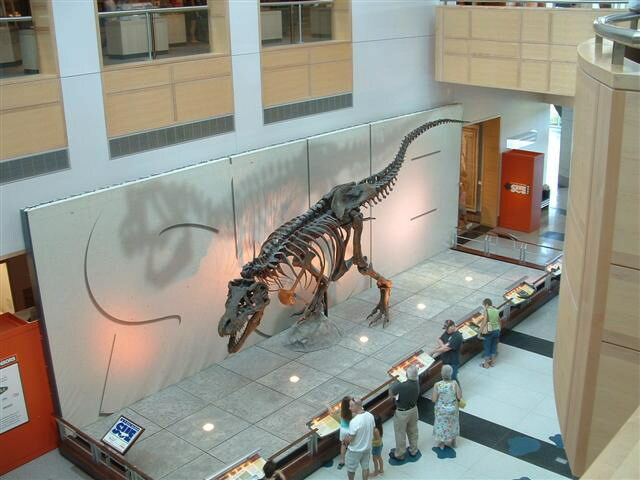 But this is an excellent museum, perhaps all the more so because here in the Mid West the war with creationism is as intense as anywhere. Out of Norman, I choose to route South to Sardis Lake, and then East, amongst beautiful mountain ranges to the very scenic town of Hot Springs, Arkansas. This a place in which I'd like to stay, but unfortunately I need to press on to the East. Perhaps I'll come back this way sometime. The way into Hot Springs is crossed by a MOA, a Military Operations Area. Checking with the wonderful flight service station before departure I learn that the MOA is not NOTAM'd (NOTAM - Notice to Airman) as as active but am reminded that it could become active at any time. Sure enough, just as I approach, the controller announces that the MOA is going hot, meaning that it's in use. The rules with MOA's are that flight is not prohibited, but that active MOA's are best avoided. In this case the detour around the outside would be far too long and I elect to continue with the flight following service that I'm receiving, although I'm cautioned that their radar may not show military traffic. 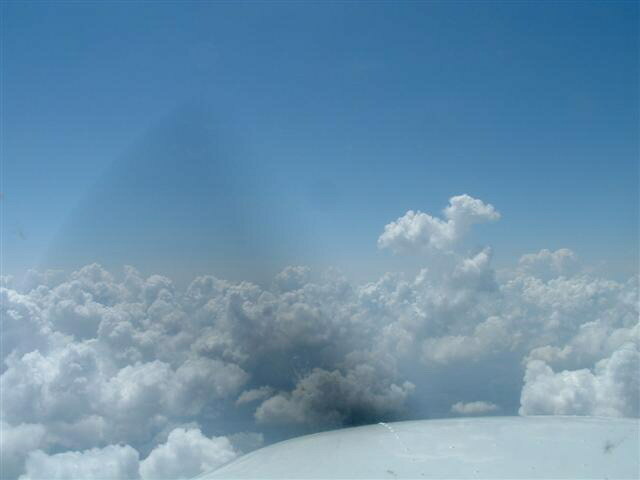 However it's a perfect VFR day and I keep a very careful lookout, seeing nothing. I'm a bit surprised to hear another, local sounding, pilot call up and start querying the rules for crossing active MOA's with the controller. 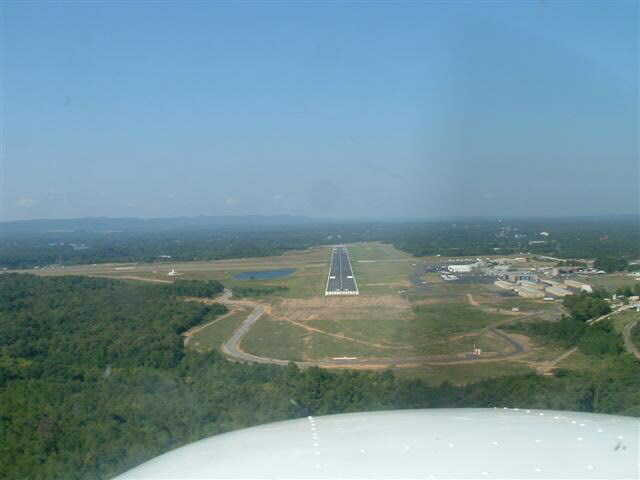 Perhaps that aspect of flying doesn't feature strongly in FAA pilot training. Also interesting is that a pilot could have such a conversation with a controller - in UK, he'd get very short shrift! Leaving Hot Springs around midday, I break my golden rule of 'Fly Early'. Things are fine at first, with initially the Arkansas and then the might Mississippi Rivers coming into view. But by the time that I cross the Mississippi, the clouds ahead look ominous. 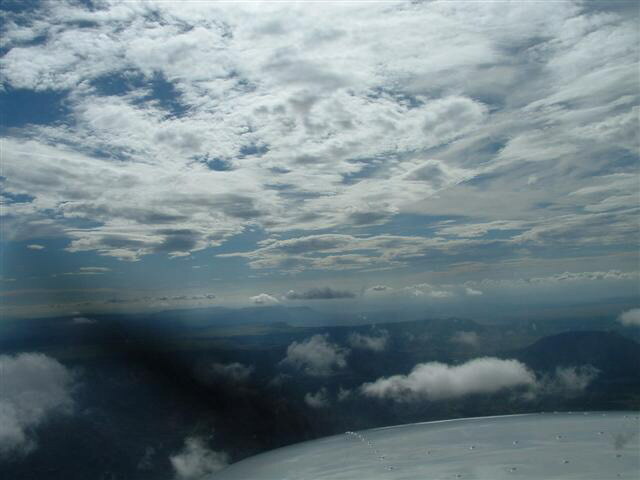 Up, up, 10,000', 11,000', but there no way to get across the tops between those anvil clouds. So down I go, gently at first to keep the engine warm, down to 3,000', 2,000' ... 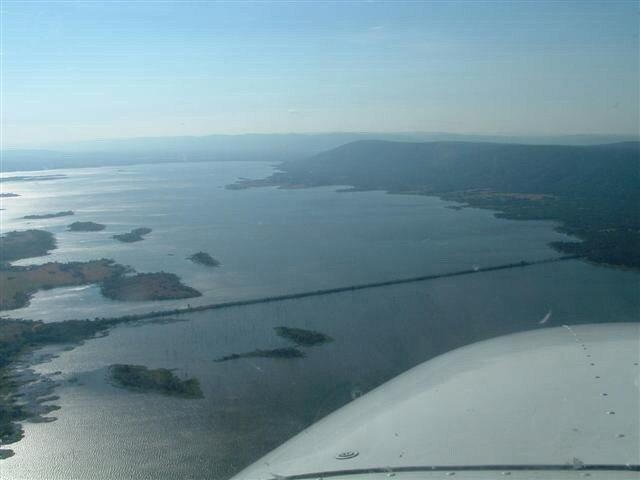 I pass a good looking airfield at the end of a lake and press on to the East. Still over the lake, the sky is very dark and ahead tendrils of cloud hang down to the water. Time for plan B! 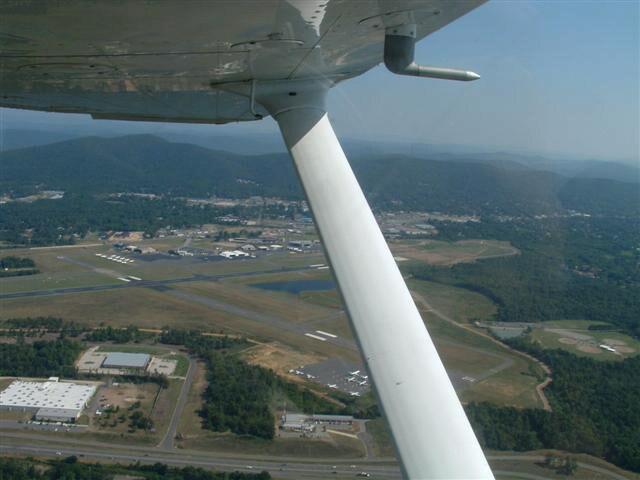 One of the best aspects of flying in the US is the availability of possible diversions along almost any route. 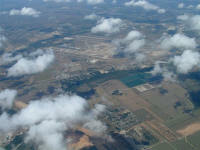 A call to Panola unicom elicits no response and indeed there is no traffic at this good sized and well equipped airport. Inside, I speak to the ever helpful flight service who suggest that a gap is forming in the line of thunderstorms that block my route to Atlanta and that if I depart in hour or so I should be able thread my way between them. Just time top off my tanks in anticipation of a non-stop leg to Atlanta, 270 miles to the East, and away again. This day will be my busiest flying day, with just under 8 hours. Ahead, the storms still tower above me, but as I route to the south there does indeed seem to be a way through. 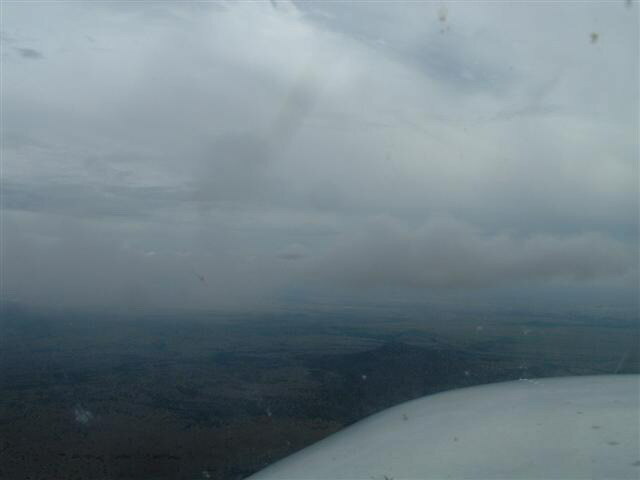 I need to maintain 10,000' and still have to weave between the cloud masses, but eventually they dissipate and I descend into a region of very murky visibility. Below passes Birmingham, Alabama with it's wide unobstructed freeways and lush forests looking not at all like the Birmingham that I am familiar with. And then the raceway at Talladega, soon to become familiar to British cinema audiences as the setting of the film "The Ballad of Ricky Bobby". 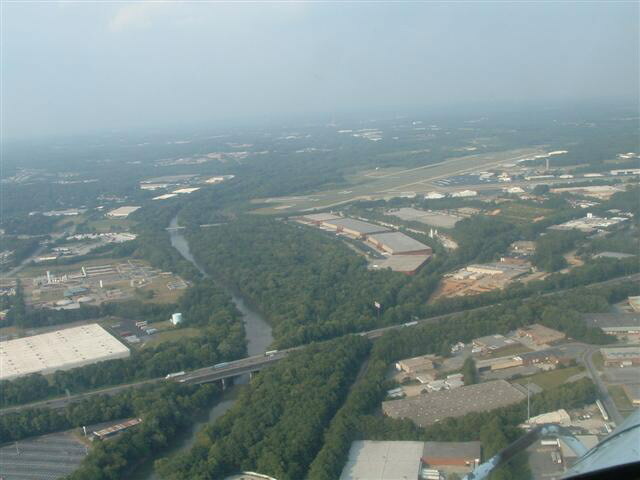 And then, in the distance at last in improving visibility, Atlanta! Soon I am in contact with my destination, Brown Field. This has been a long day. The 366 miles from Brown field to Kissimmee prove to be the most tiring 4Hrs of the entire trip. 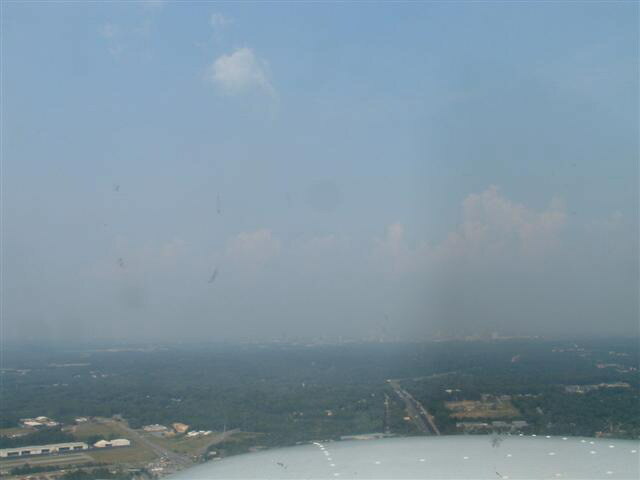 Visibility is very poor (2-3 miles in Atlanta) and in Florida traffic is everywhere. 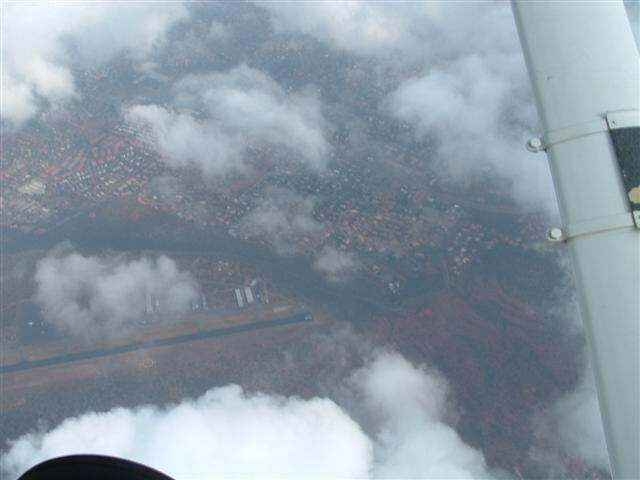 Depart Brown Field using a VFR routing and manage to find the waypoints despite the murk. 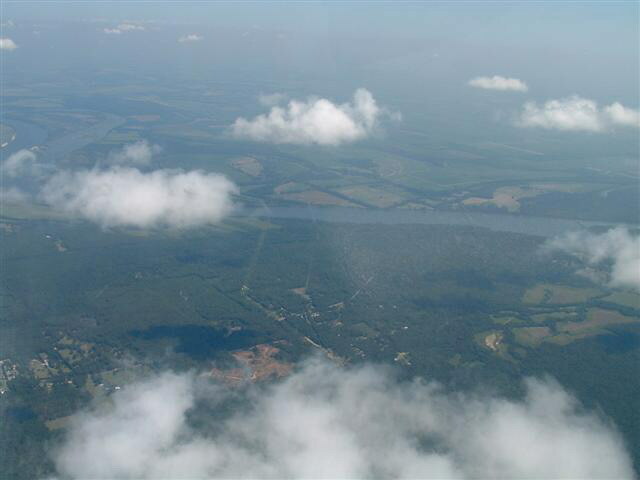 And then, clear of the Atlanta area, I can climb on top of the inversion layer and enjoy some clear air. While cruising up here, I hear a pilot ask the controller, who has a very deep, somehow familiar voice "Say, is this Buzz?". To which the controller replies "Nope, he's much older than me". So did the pilot think that Buzz Aldrin was moonlighting in Atlanta center? It sure sounded like him, although he'd be far beyond the FAA's compulsory retirement age. I'll never know, and I suppose the pilot was asking after some other Buzz ... or was he? All too soon it was time to descend back into the murk, this time Florida murk. Florida! Prescott seemed very far away now. On my track into Kissimmee world was Disneyland and a chart adorned with warnings about a prohibited area recently introduced to prevent people deliberately crashing into the place. I requested a level just above the restriction and the lady controller said "You can go lower over Disneyland if you like: as low as you want". Actually, I was having trouble identifying landmarks because of the murk, and said 2000' would be just fine. 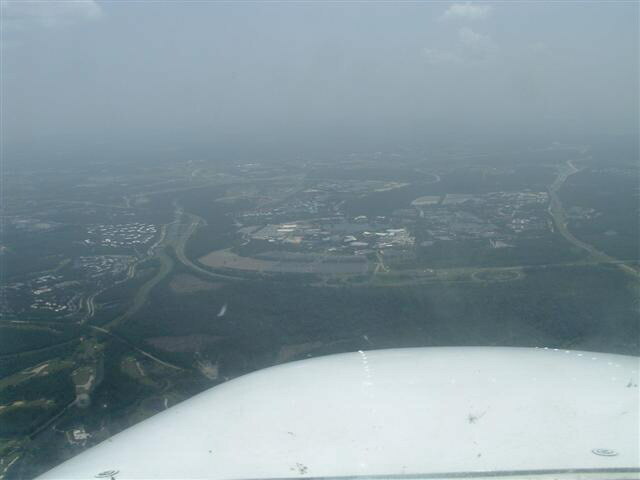 Passing Disney's Epcot Center the field at Kissimmee should have been clearly visible but there was no way to make out the runway from Florida's landscape of freeways, parking lots, canals and other seemingly runway like features through the murk. Kissimmee's controller was becoming increasingly impatient with my inability to see the field - with my British accent he had no way to know that I wasn't one of the hundreds of UK pilots who visit Kissimmee for training and PPL hire every year. He certainly didn't know that I had never seen the place before or that I had crossed a continent to get there! Part II - time to go home! All too soon (although it's never too soon to leave Florida, in my opinion) it's time to pack up and head back to Arizona. For the return leg, I've decided to follow the Gulf Coast round to Galveston, Texas, and then inland across that vast state to Carlsbad, New Mexico, where I want to visit the famous caverns. 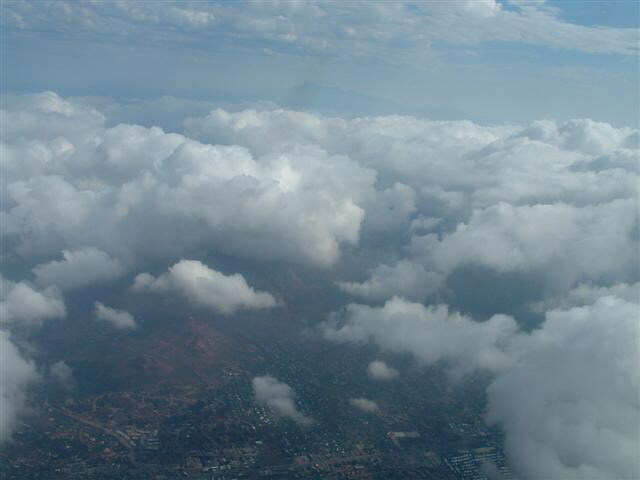 From Carlsbad, it's a short hop home to Prescott. 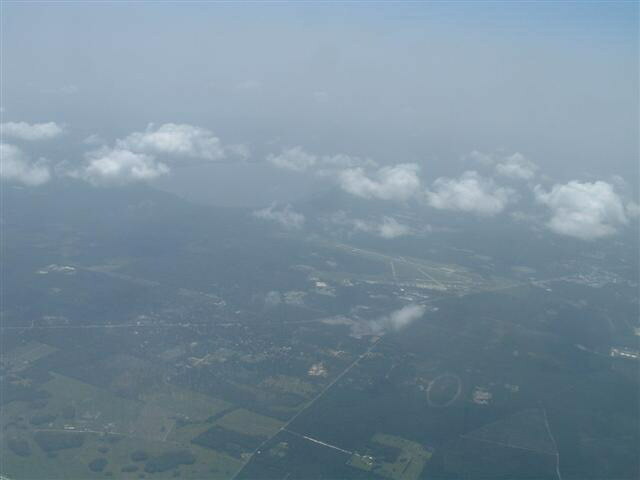 Departing Kissimmee I am at last able to see the airfield that was virtually invisible to me through the murk on the way in. Soon the Gulf Coast of Florida beckons, and with it tiny communities like this one at Horseshoe Key, Florida. Northern Florida is a wilderness of swamps and rivers that would provide few landing places in the event of a problem. I find myself staying close to highways, but as I go further North and East even those become scarce. 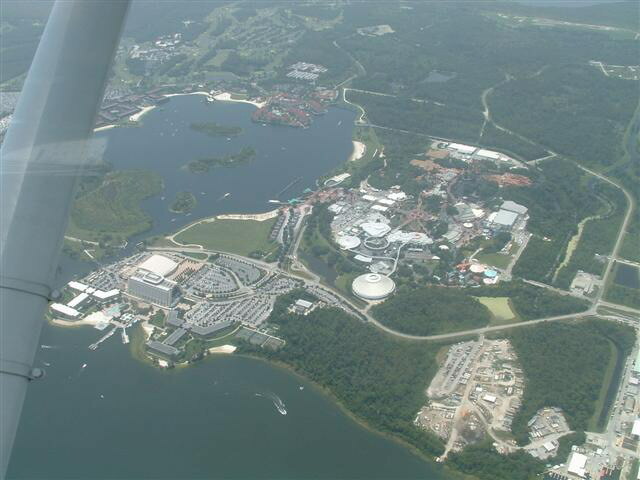 Soon, however, my first destination of Tallahassee comes into view. After refuelling, I am away again to my overnight stop at Pensacola, about as far west as you can go in Florida. I join the coastline and get my first view of the gently curving white beach that stretches away into the far distance, all the way to Texas, 500 miles and more. This view is utterly intoxicating and I almost imagine that I can see Galveston away in the distance as I close in on Pensacola. Pensacola's runway soon fills the windscreen and I wonder what tomorrow will bring as I park the little plane overnight, under the ever helpful gaze of the local FBO. Everywhere that I travel in the US, the local FBO (Fixed Base Operator) extends a welcome, useful information, discounts at hotels, free lifts into town, and much more. Sometimes they have 'courtesy car', a car that you can use for free in return for some gas in the tank. One guy even lent me his own personal car to go sightseeing - but British visitors need to be wary of these gift horses because they are usually devoid of insurance. Nest morning, and sticking to my rule of 'fly early', I am away by 7am on what is planned to be the longest leg of the entire trip - 400 miles in 4 hours to Galveston, Texas. Already little clouds are bubbling up along the superheated Gulf shoreline and soon the little clouds start to grow anvil shaped heads. As the day warms up and I drift slowly across Georgia, the clouds form up into a continuous line of thunderstorms just inland from the coast. By staying just offshore of the beach I can remain clear of the convective air currents, while closely studying the small airports that pass by along the coast in case my way ahead becomes too difficult. Occasionally I have to deviate inland or over the sea to avoid a particularly big storm, but I can always see clear air ahead from my vantage point of 10,000' above the sea. On this leg I take the unusual step of setting the Cessna's fuel selector somewhere other than 'Both', a procedure normally reserved in this aircraft at least for parking on sloping ground. Like most training aircraft the little Cessna flies slightly out of trim, causing the fuel to drain from one side to the other. Rather than keep a continual and ultimately painful pressure on the rudder pedal (The Cessna has no rudder trim, unlike the PA-28) I monitor the tank contents which must follow my calculations if I am to complete this long leg with sufficient margin. Just in case, I've pinned a note to the flap lever saying "tanks to Both!" just in case I get a little punchy, like the Jack Sweighart character in the film "Apollo 13". Approaching the Mississippi Delta, my track crosses inland along the line of vast canals and soon an inland shoreline appears. This is New Orleans, just a year after it was devastated by hurricane Katrina and still looking almost deserted today. This great city makes a sad sight indeed and provides a salutary lesson on the power of nature. About the only activity that I can see is teams of construction workers building new lock gates between the Lake and the City. There are very few cars on the roads and the residential districts that I am crossing seem largely deserted. Eerie indeed. It's a relief to pick up the mighty Mississippi again to track along it to the West one last time. And then the Gulf coast comes into view and I am back along the shoreline, dodging the thunderstorms. After 4 hours in the air, I cross the border into Texas and Galveston Island emerges, right on schedule. Soon I am lining up for Galveston's Scholes airport and looking forward to a brief stay. It's been a long day, but perhaps one of the most spectacular and rewarding trips of my entire flying career. Poor Galveston has been in the news this week and this prompted me to start writing up my visit there. I first drove down to Galveston out of curiosity when attending a trade show in nearby Houston back in the early 80's. I remember arriving at the deserted sea front, the shabby dilapidated buildings and the pebbly beach covered in oil. In fact, the smell of the oil lingers with me today, as did the stuff that got on the carpets of my rental car and, not for the first time, I was glad I had taken the LDW! So when I decided to route back to Prescott through Galveston I didn't have much expectation of the place. What I found was a true eye opener. Galveston is a beautiful seaside resort, like a big Torbay, but with the extraordinary benefit of a sea that is warm enough to bath in! It's tragic to see the colossal amount of damage caused by Hurricane Ike (September 2008) and I can only hope that the people of Galveston will be able to put their city, and their lives, back together again. So here's Galveston's Scholes International Airport (KGLS), elev. 6', right on the ocean. From Scholes it was a very short ride to the beachfront with it's numerous hotels right across the street from the Gulf of Mexico. This vista of soft clean sand stretches for mile after mile and the temptation of the Ocean is irresistible! I found myself spending hours wading far out to sea in chest high water, fascinated by the schools of little fish that swarmed around my feet. With lifeguards on duty and numerous other swimmers around, the place felt completely safe and welcoming. What a contrast with the dirty, run down and unwelcoming Galveston of 25 years before. But my visit to Galveston was not just about the sea-side. In the harbour is a beautiful sailing ship, Elissa, built in Scotland in 1877 and still seaworthy today. Elissa is an Iron ship and sailed under the red ensign until 1897, making her one of the oldest British ships still afloat anywhere. (Perhaps the oldest is the Star of India, also preserved in the US, in San Diego). Elissa mooring is alongside the Galveston historical museum, which with some prescience tells the story of the great storm of 1900 when Galveston was completely destroyed and more than 5,000 people died. Writing this in 2008 I am greatly relieved to learn that Elissa and indeed the museum have apparently survived hurricane Ike. Downtown Galveston has a fascinating trolley (tram) system as well and even an extensive railway museum. But I wasn't just in Galveston to see the Elissa. Memory told me that just up the road was moored the battleship Texas, the last surviving Dreadnought in the world. When I had been in Houston before, I had gone out to the mooring as it then was to see a ship in a woebegone state and inaccessible to visitors. What I now saw was another amazing transformation. Texas towers above her visitors, fully restored and providing a spectacle that cannot be seen anywhere else in the world. True, there are many other preserved battleships in the US, but none of them date from 1914! Although built in the US, Texas is the only survivor of the British inspired first war battle fleets. Indeed, she is virtually a British design, far more closely resembling Royal Navy ships of the period than later American designs. So closely does Texas follow British practice that I was able to answer many puzzling questions that arose in my model of Mars that could not be resolved by studying indistinct contemporary photographs. As you can see in the photo above, Texas would not have looked out of place in Scapa Flow and indeed did operate with the Royal Navy in both wars, even being present at the D-Day landings. In one respect Texas is even closer to Victorian battleships like Mars than I had expected. On entering the engine room I found to my considerable surprise that she is powered by triple expansion engines, not the turbines of Dreadnought and her successors. Her engines must be amongst the largest surviving anywhere in the world and the cramped conditions within her huge engine rooms give an impression of what the smaller Victorian battleships must really have been like. 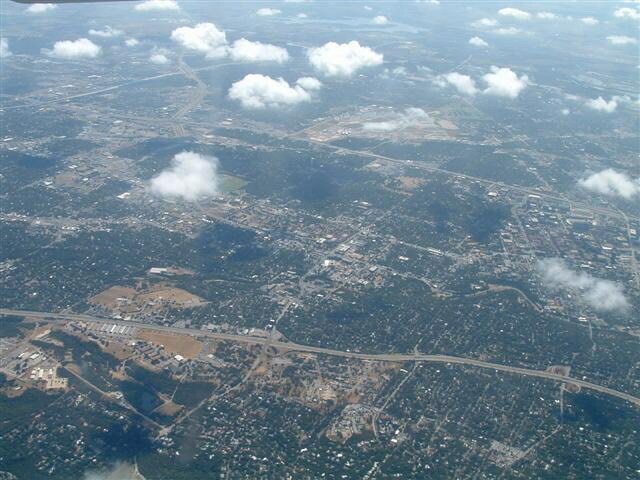 Here's the state capital of Texas, Austin, from 10,000'. Austin airport is in the right-hand picture. Texas is vast! These plains seem to go on forever. It's just 200 miles to my next destination, Carlsbad, New Mexico. 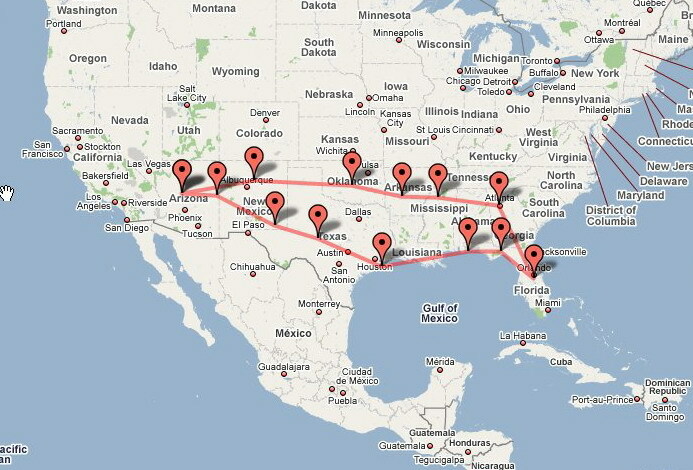 The route takes me out of Texas via the twin cities of Midland/Odessa. I remember one night a long time ago looking out of the window of a commercial flight at these cities and picking out the runway lights of Midland International which lies between them. I recall thinking about what a long and adventurous flight from Prescott that would be! Now, it's just a waypoint on a much longer journey. Up here at 10,500' I'm just playing in the cloud tops on this beautiful Texas morning. 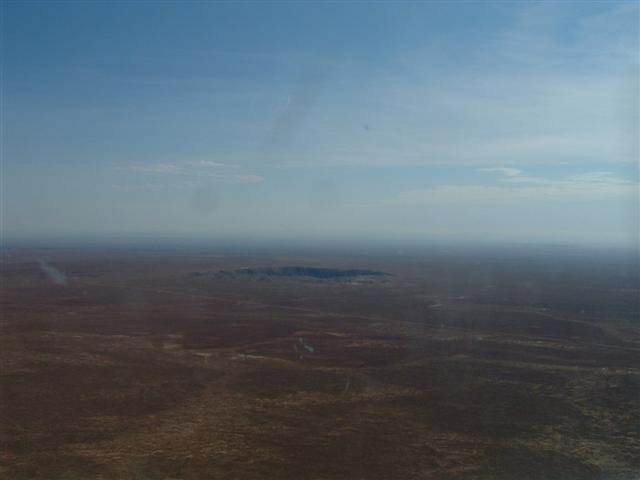 Below, the terrain is dotted with countless oil wells. 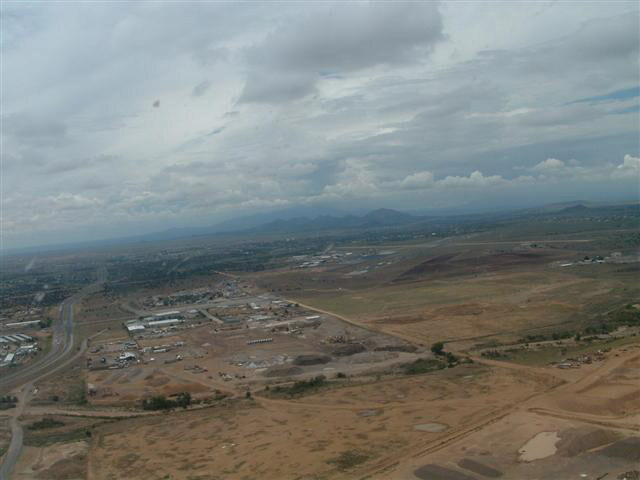 Before long, I'm in New Mexico and the Cavern City Airport (CNM) is emerging on the horizon. Fortunately I've called ahead for a rental car, because the airport is totally deserted. It's 30 miles to my destination at Carlsbad Caverns and a car is must. After a while, a charming young lady appears with the car and I drop her back at the rental place in town before heading South. The Caverns are every bit as impressive as I had expected, but what came as a real surprise were the bats! I was lucky to have timed my visit with an afternoon arrival and stopover, so when the Ranger at the entrance asked if i would be staying to see the bats, I naturally said 'yes'. I had no idea what I was saying 'yes' to! Now my cavern photography was, shall we say, disappointing and so I can only refer you to other websites on the subject. But impressive the caverns certainly are. You descend to an underground visitors centre by elevator before setting out on self guided trails that wind through spectacular subterranean landscapes straight out of 'journey to the Centre of the Earth'. The trails run for a mile or more and pass vast underground pinnacles and countless stalactites and stalagmites. Back in the warm air above with dusk approaching, my timing was perfect for the 'bat cave'. I was surprised to see that the natural 'sink hole' geology of the cave entrance had been made into an amphitheatre, with concrete benches all around, seating quite a few hundred expectant visitors. Photography is strictly prohibited at the bat cave because supposedly even the little click made by a camera can be disturbing to the bats. "What, even an electronic one? With the sound effect turned off?" someone asked a Ranger. Oh yes came the confident reply. "No cameras, or videos, at all". My sceptiscm strengthened. OK, I thought, so a few bats will flap out of the cavern below with their cute squeaky noises and sort of dart off somewhere. I thought. It got quite dark and the expectant hubbub of the crowd was arrested by an announcement from a Ranger deep within the cave that the bats were coming and that we should be silent. A long time passed and no bats. hmmm... The commentary claimed that the roosting site was more than a mile inside the cave and they were definitely still coming. Then, in the centre of the amphitheatre, a single bat appeared, darting about and then vanishing. Then another, and then a few. I was quite impressed about how they spiralled up out of the cave entrance gaining height before heading off somewhere. I thought "As they spiral up, they actually fly toward the crowd. One might come quite close". A few more bats appeared. "Quite good" I thought "almost as many as we around the house in England". But the odd thing was, as these bats climbed away, their place seemed to be immediately taken by another, spiralling out of the cave and climbing up in front of the audience. By now we had been told to be absolutely silent and it was possible to hear the occasional chirping noise. But the odd thing was that these audible chirps seemed carried on a silent roaring sound, like a distant wave crashing on a beach. "Odd, I thought, we don't get that in England". More bats were climbing out of the cave, forming an inverted cone as they spiralled upwards. You could see 10, 20 bats at the same time. "Impressive" I thought. Some of them were only a few yards from me as they circled upwards. I thought momentarily about the advice we had been given to keep our hands down. "There might be a lame one that crashes out of this orbit" I thought. Slowly, and a little reluctantly, I had to admit that the roaring noise that I'd imagined hearing was fairly persistent. It was an odd sound - like a modulation on a carrier that you can't hear - something very loud indeed, but still only barely detectable. It was around this time that I realised that there might be quite a lot of bats down there. I noticed that the orange floodlights at the cave entrance were dimming and for a moment imagined that the park Rangers were doing it for some reason. But then I realised for the first time just what the phrase 'A million bats' actually means. The lights were dimming because emerging from the cave was a solid mass of bats, all spiralling furiously like a vast spinning top toward the darkening sky. Up they came, into the amphitheatre, in a dense cloud, thousands of bats, all together, spreading out as the numbers rose, using all the airspace available. Now I knew why we had to keep our hands down (and the real reason for no photography). The bats were hurtling around the audience, right in front of our faces, not feet, but inches away! Astonished at this unimaginable spectacle. I looked up to follow their flight path and saw what I thought for a moment was a low cloud on the horizon. A black cloud. An indeed it was a cloud - of bats - in this deep azure sky. Forming a long tendril, this cloud strode purposefully away to the SW, toward the Rio Grande river and beyond it, Mexico. And still the bats came - swirling in a dense black cloud, sometimes in amongst the seated crowd, swirling upwards and all the time that inaudible roaring sound, all around us now. It took more than 30 incredible minutes for the estimated million bats to pass, 30 minutes of an incredible experience that I would never have believed it possible to witness. And not a single photograph to prove it. Now I'm on the home straight. My next stop, St John's Industrial, puts me firmly back in Arizona. Between me an St John's lies the White Sands missile range and I optimistically call up for a clearance through. "Not a chance!" comes back the reply, and so unsurprisingly I end up routing a long way around the Restricted airspace. Entering Eastern Arizona, I'm fascinated by the lush green valleys here. Leaving St John's, I'm breaking my golden rule again and flying in the afternoon. St John's is 5,700' and it's very warm at lunchtime. 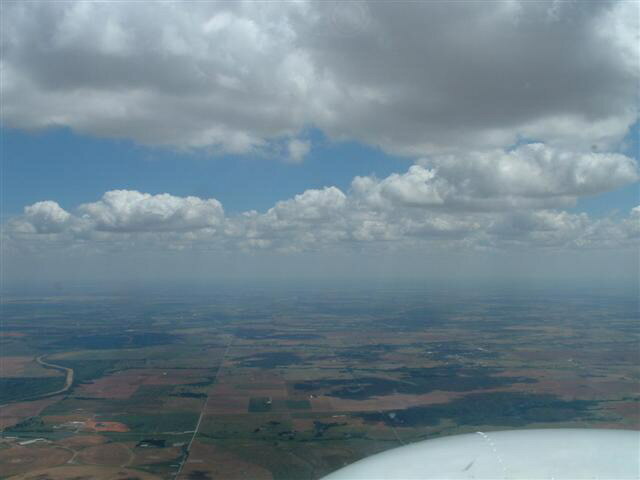 The Cessna with full fuel feels distinctly soft at 60kt and I hold it level while the speed builds up. Slowly we climb away, watching the huge build-ups away to the NW, right where we are headed. August afternoon in N Arizona equals thunderstorms and this day is no exception. 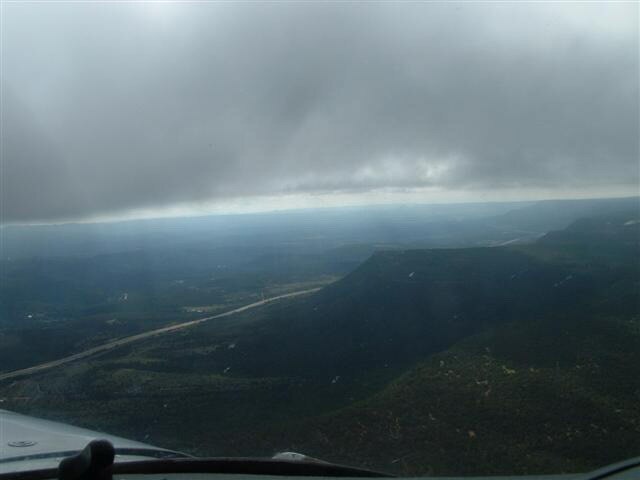 I skirt around the storms that threaten to close off my route, deviating to the N around Flagstaff. Flagstaff with Humphreys Peak (12,633') in distance. Soon I can see the familiar shape of the San Fransisco mountains, right up by Flagstaff. Fate smiles on me and a way through the storms becomes clear. Soon I'm recognising familiar land marks - the Mogollon Rim and the Black Mountains, over by the little mining town of Jerome. 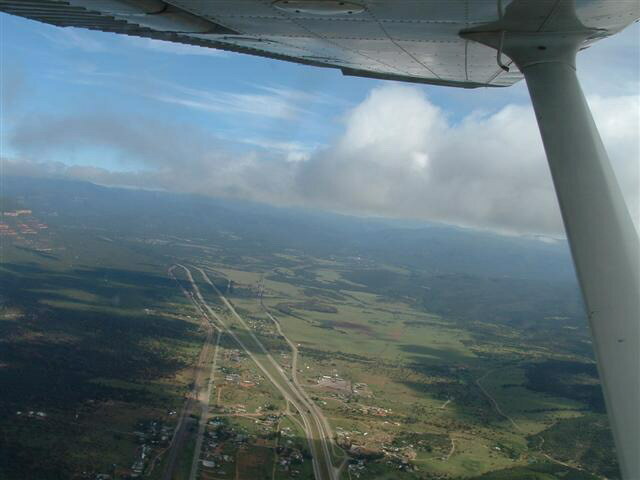 Here's Prescott's welcoming Runway 21L, 40 Hours, 2 1/2 weeks and 3,500 miles after I left. The tower even call "Welcome home 49Q". Notes about the 172R and other 172's. 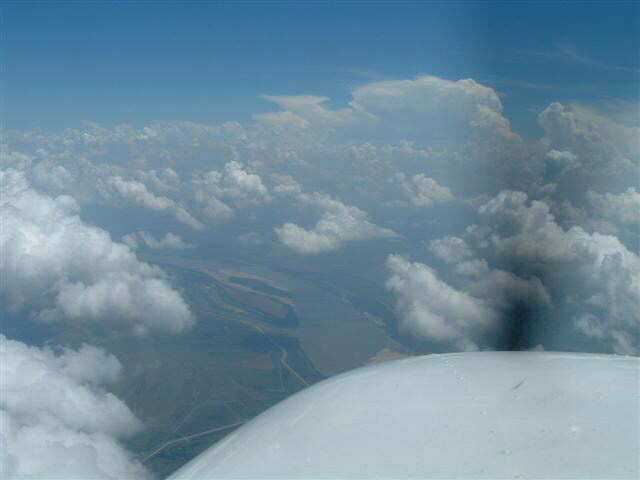 A popular topic on pilot forums is "which is best - PA-28 or 172?" The windscreen in the 172R and SP is truly awesome, for a short person like me at least. With the seat right forward I can sit right up in the superb bubble canopy with 180 deg vision and absorb the scenery around me. The things that I have seen through that windscreen - the Canyon, Yellowstone, Catalina Island - will live with me forever. You learn to have a can of Plexus and a wad of scratch free towels to hand on every flight with that windscreen because you don't want anything interfering with that wondrous view. This 172 advantage works equally well in the US and the UK! The high wing makes for far better sight seeing and in the US, that's a major consideration. OK, many of my photos on here have the strut in centre field, I know. But compare that with the Warrior's wing as an obstruction and it's no contest. And the lack of a fuel pump and (usually, not always) no need for tank changing are a bonus. But this works best in the US: there's always an FBO person with a step ladder ready to rush out and fill the tanks for you. In the UK, where fuel pump attendants like to watch your struggles with heavy hoses with folded arms with an air of detachment, it's not so good. A definite plus for operating the Warrior in the UK. Short field performance always feels better in the 172, although the book values are very similar. But in the desert terrain of the Western US, that high wing is a potential difference between successful forced landings and otherwise, able to avoid boulders and mesquite bushes. And it always feels as though it would land slower. Mind you, the old Aerleon school at North Las Vegas had a 172 returned by a renter with a big dent in the leading edge. "Hmm, must have hit a bird" the guy said. Some time later, they got a new student who was a traffic cop. "Strange", he said. "We'd been wondering what did that". "What?" they said. "Oh, there's this traffic sign out in the desert. Folded right over as though something hit it 10' off the ground". But in UK, most flights to anywhere involve water. And I live with the delusion that somehow landing the PA-28 on water would be easier than doing the same thing in the 172. Of course both types are equally likely to flip over on landing, reversing the situation. But it just feels better having that Warrior wing between me and the cold dark North Sea. And with the older Warriors at least, the seats fold forward giving easy access (In theory) to the life raft on the back seat. Not so the 172's clumsy seats with tall headrests and complicated seatbelts - extracting the life raft from there could be quite difficult. Not an inherent PA-28 vs. 172 difference, but fuel injection is a big plus in the 172R and SP. No pesky carburettor heat to worry about and no carb heat cable to fall off in flight (yes, that happened to me, about 50mi out to sea.). Starting the injected engine can be tiresome when hot, but no worse than a flooded carburettor engine. And most important of all, there's almost no fire risk from over priming. If you are wondering, the hot starting drill is no priming at all. Only if it won't go do you consider introducing fuel. I've had no starting problems with the 172R over many, many flights apart from one occasion when I primed the hot engine. Baggage: the Warrior has a wonderful load door able to take the largest suitcase or computer system. The 172 in contrast is narrow and awkward and with my luggage at least means carrying some items on the back seat. But now the real issue: Appearance. As a prospective passenger once said of the Warrior: "Ooh! 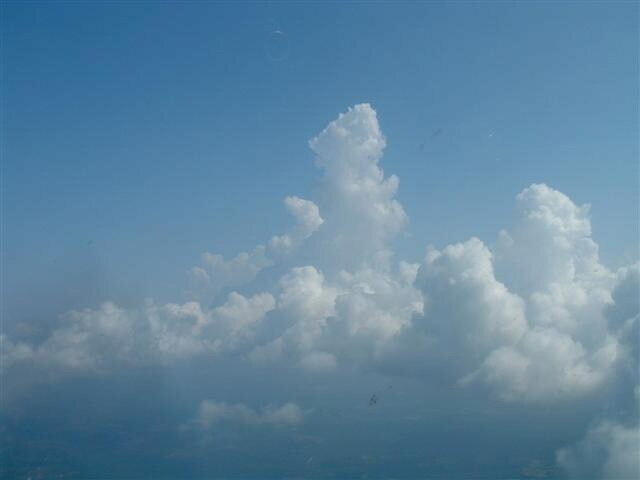 It looks like a real plane!". Contrast that with frequent remarks about the 172 resembling a lawn chair strapped to the pilot's back. So at home, in the UK, where family sometimes come flying and often turn up to meet me, The Warrior's styling wins hands down. But in the US, where I'm usually on my own and certainly don't care what other people think it looks like, the 172's fabulous view is a no-brainer. I've no plans to rent a Warrior in the US anytime soon.